DrumQuik PUR Drum Inserts are designed with quick connect/disconnect capabilities in order to allow for faster drum change outs. 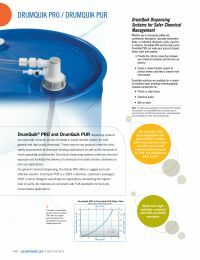 DrumQuik PUR systems are cleanroom manufactured to ensure a high level of purity. These systems come with an automatic shutoff valve and create a closed transfer system for chemical handling. Using DrumQuik dispensing systems helps users keep a clean and safe work environment.